Throwing all expectations for such a loud and brash band, 'Burn Your Town' opens at a very slow pace with first track 'A Certain Degree'. Purposefully this displays the band’s full talent before you get sucked into all the noise, the spine-chilling harmonies (and whispers) and the pleas from lead singer Kingsley Chapman throughout, definitely easing the listener in. 'All Fall' is a crashing collection of drums and guitar, all with Kingsley’s Ian Curtis-esque drawl ringing over the top. It would be easy to write the band off as moody northern misers, but at times real gems shine through, especially in the form of 'Anxiety', an almost pop song from the group, though a particularly gloomy pop song at best, and 'Sound Of The Radio' is another, of seemingly epic proportions. Guitars hold the main draw to this album, with them seeming at times like the whole idea is to play them as loud as possible, possibly adhering to Muse’s philosophy of the louder the better it sounds, but some of the best moments of this album are the quietest. Take for example the end track 'Virgins', a 12-minute rework of the band’s live set staple, introducing subdued instruments and vocals for the first half of the track, further showcasing the bands ability to do something a little different than expected, that can surely only help their appeal to the wider market. As you near the end of the album, the live favourites are thrown in, most likely to keep the older fans sweet. 'Kids' illustrates the band's primary talents, producing a swirling cacophony of noise condensed into just less than 4 minutes. 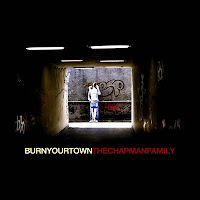 The squalor and feedback of a seemingly live recording helps to translate what is oft missed on this album, recognition of what an aggressive live band The Chapman Family are. 'Burn Your Town' demonstrates what the band do best - noise and misery. And to be honest that fine by me. In the overly processed pop world we live in, The Chapman Family are a refreshing change, and when we have the 'Glee' cast entering the album chart The Chapman Family are definitely needed! Stream the album in full at Soundcloud. Purchase the album from iTunes, Amazon, your local record shop etc.